Unless you’ve been living in a cave recently it’s safe to assume that you’re well aware of just how many people seem to get caught up in rushing through their days and lives just to keep up with things. I call this being stuck in the hurry sickness that seems to overtake peoples lives. As everything continues to accelerate faster than before such as our interactions with each other, how we work, our thoughts, and even the way we relax, it all takes it’s toll on our health, happiness, relationships and quality of life. One of the simplest ways to get our lives back in control and prevent ourselves from experiencing constantly being stressed, tired, unmotivated and overwhelmed, is to find the joy in slowing down. When we take the time to slow down and give ourselves 100% to what we are doing, who we are with, or where we are at, then life gets easier and more enjoyable. 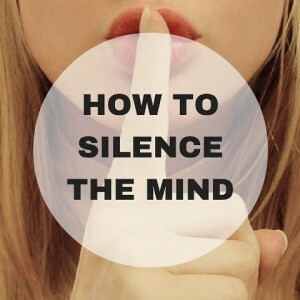 Learning how to quiet the mind chatter is one of the most powerful ways to slow down. While many might think that most of the stress in their lives comes from not having enough time, money, support, or something else from the outside, in reality, almost all stress comes from what we think and feel about the things that go on in our lives. The minds job is to be constantly on the go. It hates slowing down or stopping because it’s unnatural for it unless it’s time for sleep. That’s why it finds so many ways to stay active even when you’d like nothing more than to have a 5-minute break from the constant chatter in your head. Make no mistake, the mind is an extremely powerful force in your life. It can either be your best friend and help you to move towards your dreams or it can be your worst enemy in that it can be that voice of negativity in your head that prevents you from being, doing, and having everything your heart desires. Once you learn the knack of quieting the mind chatter, then you have more power to choose the thoughts and feelings you want to focus on. Then, it’s far easier to not only slow down and enjoy being more present and aware in your life, it also enables you to manifest what you really want faster and with less resistance. So why would we want to clear the mind? Well for one thing, a clear mind is a calm mind, and when we are calm it’s easier to focus on solving problems because we can tap into our creative mind with greater ease. For another thing, while we are calm it’s harder for stress to take hold of our mind and body, and we have more empathy and tolerance for others which means our relationships are healthier. But that’s just the beginning. The real payoff is that when the mind is clear, then we are more at peace and relaxed in our lives. This is not only beneficial for our mental and physical health which means we’ll get sick less and most likely live a longer and more enjoyable life. It also means that we’ll make better decisions and have more control over our personal, financial and professional destiny.